It could be frustrating at times when ambient noise from the environment has to interfere with your calls, music or other important thing you may be listening to on your phones. This is especially true if you are a frequent traveler as noise from trains, airplanes, airports and busy street may deprive you of clarity and proper audibility of what you set out to listen to. How then do we best tackle this if not with some of the best noise canceling earbuds? What are these noise-canceling earbuds? How beneficial are they and do you really need them? What are those things you’d need to consider when choosing your best noise canceling earbuds? Of course, we’ll present to you our own suggestions of the best active noise canceling earbuds later on in this review, but before we do that we’ll like to answer some of the questions posed above to help you understand how we arrive at our final choice of the best noise-canceling earbuds. Do you want over-ear or in-ear headphones? Do you want active or passive noise cancelation? Do you want wired or wireless connectivity? But wait, why should really need the best noise-canceling earbuds? Noise-canceling earbuds are able to block out or reject ambient background noise so that these noises do not cause disturbances or interferences to your phone calls, music listening and other phone audio-listening moments. To ensure you do not end up with a dud, you’ll certainly need to make some considerations. First, of course on the list is pricing. These noise-canceling headphones could be somewhat pricey but that is not to say there aren’t those with modest pricing. The truth of the matter is that you end up enjoying what you pay for. You could find the best noise-canceling headphones to retail anywhere within $200 to $400. Although we still have some of those budget-friendly noise-canceling headphones that still offers a decent amount of noise canceling and sound quality. 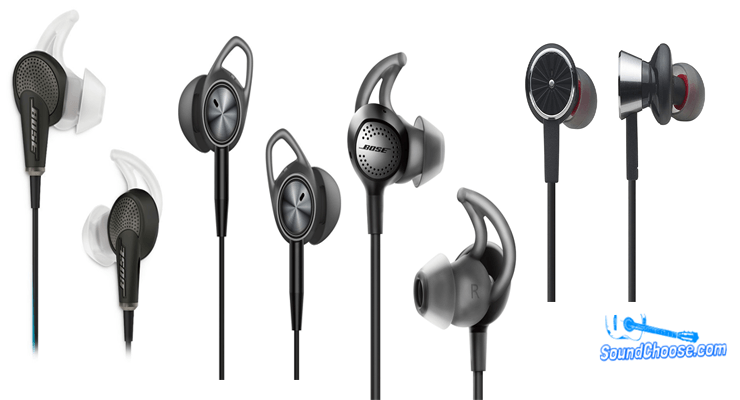 Over-ear headphones come with their own benefits and cons same as with in-ear earbuds. Knowing what you want though will help you with making your decision. For one, earbuds could prove useful as they could offer more comfort because some of these are so flat you can even sleep with them on. The headphones though seem to offer better sound quality although you’re still able to get heart-popping beats from some of the best noise-canceling earbuds. ANC headphones cancel noise actively by producing inverse sound waves that reject the interference of background noise. The passive noise canceling earbuds on their own works literally like sticking your fingers in your ears. The term noise isolation is often used for passive noise-isolating earbuds. Although we have one very good example of a passive noise canceling earbuds on our list, their ANC counterparts seem the best. That is another thing. There are some of these best noise canceling earbuds with Bluetooth connectivity. These could offer more comfort and flexibility. Depending on your preference, you may have to make this choice before you splash out the cash. Since you now know what to consider, half of the job is done. There are so many brands and models that may leave you confused if you have to test them all out. We have compiled this guide to ensure you get it right the first time and so following the tips below may help you choose the best noise canceling headphones with wireless or wired connectivity. When you tick all these lines, the possibility of getting it wrong will be almost non-existent. If you are a frequent traveler or you often find yourself in noisy environments like busy streets, airports, train rides, construction sites, in-plane flights and more, then you don’t just need a noise canceling earbud, you need the best noise canceling earbud available in the market. These earbuds can also be very useful if you’d like to work with more focus in a noisy environment or office space. Having your headphones or earbuds on while grooving to some of your favorite tunes rejecting unnecessary and distractive noise can help you achieve more focus and productivity at work. If you examine your routine daily activities and you find yourself in any of these categories, then it is high time you pick up one of the best noise-canceling earbuds your budget can afford. Although brand names are not all that matters, you can expect a certain confidence to arise from the quality of Bose earbuds due to their reputation of going overboard to satisfy consumers. With one of the most sophisticated ANC technology that rejects almost 95% ambient noise, the Bose QC20 will have you on mute for most times. This earbud has both the noise isolating and rejection feature. The ear tips are tight enough to block out noise even when the ANC feature is not in use. There are the rubber wings that ensure they stay on even when on the run. The sound quality too is pretty excellent and you just couldn’t ask for more! When it comes to ANC give it to Bose, their line of over-ear ANC headphones too are the best in their category and its no wonder that these two also came on top in our list of the best noise canceling earbuds of 2018. For some, a wired connection may be uncomfortable, after all this is the 21st century. For those of us who like to live in the future, the Bose QC30 is your best bet at getting on of the best wireless noise canceling earbuds of 2018. See it as getting all of the benefits of the QC20 without the clutter. The QC30 too will blow your mind. Remember when we struck out the difference between active and passive noise reduction? We made it clear that earbuds with the passive feature literally isolate noise and so we refer to this as one of the best noise isolating earbuds. Although they generally seem to be not as effective at noise reduction as active noise canceling earbuds, the Shure SE535V proves that something great can still come out of noise isolation and being only one of the best noise-isolating earbuds that made our list speaks volume. The Phiaton BT220NC offers a great balance of price and performance and even though the Bose QC30 may seem out of reach for some folks who prefer to go wireless, the Phiaton BT220NC may not seem all that bad after all, in fact, it’s not bad! With a solid rating and acceptance on Amazon and a few other retailers, the Phiaton BT220NC will give you active noise canceling and an above average sound performance that as made it nonetheless an important part of our best noise canceling earbuds reviews. Let’s check out the features on this model. Rather than limit your options to one or single overall option, we brought you more so you can enjoy the luxury of choice. Although the Bose Quiet Comfort QC20 remains our best overall pick, there are also other options and no matter your preference and needs, there are always enough to go around. For the best wireless noise canceling earbuds, choose the Bose Quiet Comfort QC30. If you are on the lookout for some of the best noise-isolating earbuds available, the Shure SE535-V does a good job of noise isolation with a very impressive sound quality to match. For more budget-friendly options, then you can check out the Phiaton BT220NC as well as the Tiatronics noise canceling earbuds. Although the quality may seem further down, they still remain the best among the others. When the need for noise canceling earbuds is imminent, it is only nice that you go for the best ones. This review contains all you need to know. From the buying guides to our own picks, you’re in for a good time. Find out what you want and pick from the variety of options before you, you can always thanks us later!